SALMON, Idaho (Reuters) - An Idaho scientist shrugging off skeptical fellow scholars in his quest for evidence of Bigfoot has turned his sights skyward, with plans to float a blimp over the U.S. mountain West in search of the mythic, ape-like creature. Idaho State University has approved the unusual proposal of faculty member Jeffrey Meldrum, an anatomy and anthropology professor ridiculed by some peers for past research of a being whose existence is widely disputed by mainstream science. Now Meldrum is seeking to raise $300,000-plus in private donations to build the remote-controlled dirigible, equip it with a thermal-imaging camera and send it aloft in hopes of catching an aerial glimpse of Bigfoot, also known as sasquatch. Meldrum, author of "Sasquatch: Legend Meets Science," said the undertaking represents a giant leap in the quest for an animal he believes may have descended from a giant ape that once inhabited Asia and crossed the Bering land bridge to North America. "The challenge with any animal that is rare, solitary, nocturnal and far-ranging in habitat is to find them and observe them in the wild; this technology provides for that," he said. Decades of alleged sightings, elaborate hoaxes and the discovery of huge footprints in the forests of the Pacific Northwest and elsewhere have led to beliefs that Bigfoot is a man-like ape, an ape-like man or a figment of the popular imagination. Most scholars discount Bigfoot as a phenomenon borne of myth and perpetuated by a mix of fakery and misidentification of real animals. They contend that science demands a high standard of evidence that has not been achieved in the case of sasquatch. No fossils or other physical evidence has been unearthed to suggest that the largest primate ever known migrated from Asia to the Americas, and no Bigfoot has been captured or killed, skeptics argue. "There is no Bigfoot," said University of Iowa anthropologist Russell Ciochon. 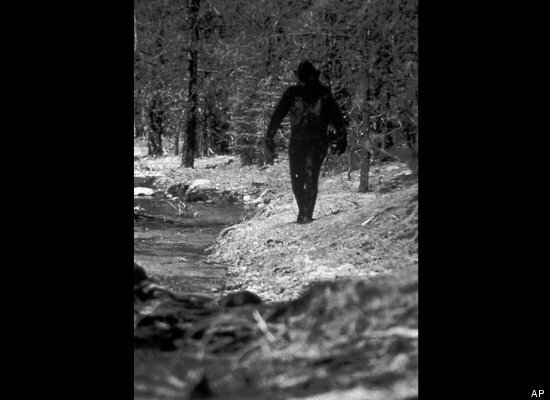 Believers describe an enormous, fur-bearing figure that walks upright in the remote high country of mostly Western states. The blimp-based search - dubbed the Falcon Project - was the brainchild of William Barnes, a Utah man who said he encountered Bigfoot in 1997 in northern California. Barnes said he watched an immense, hairy creature that was otherwise "well-manicured" approach his tent before striding up a rocky ledge. Years later, he approached Meldrum, well known in Bigfoot circles, about his idea for an airship expedition. Barnes and Meldrum hope the Falcon Project will take flight next spring. They envision a months-long expedition that will survey swaths of remote forest across parts of the Pacific Northwest as well as northern tiers of California and Utah. The aerial evidence is to be dispatched to teams on the ground that would seek to trace evidence or "try to make contact," Meldrum said. Financial support for the venture has been slow in coming, with Meldrum failing so far to raise a single dollar for the effort. But he told Reuters he was in talks with two cable channels vying for rights to produce a new weekly TV series following the Falcon Project from its inception. Indigenous peoples from Asia to North America possess lore about colossal creatures akin to apes that live in extreme alpine environments, shun contact with humans and are variously identified as the yeti, Bigfoot, the wild man or mountain man, said William Willard, professor emeritus of cultural anthropology at Washington State University. While powerful, those myths have no scientific validity, he said.